The chapter on "Modeling low-temperature geochemical processes (v. 5, c. 2)" discusses the development of geochemical modeling software. Several USGS geochemical modeling software packages, such as OTEQ (One-Dimensional Transport with Equilibrium Chemistry), a reactive transport model for streams and rivers, are discussed in the chapter. Many of the USGS software packages were developed in conjunction with Toxics Program investigations. 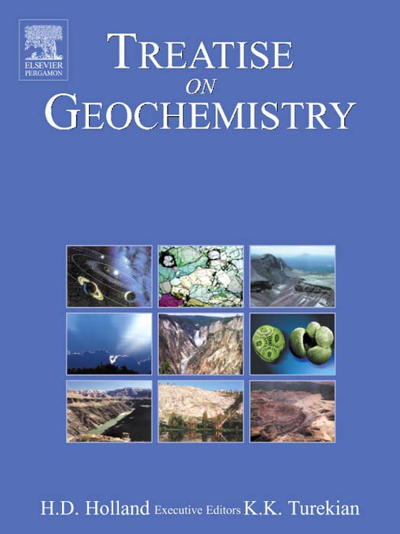 The chapter on "Geochemistry of ground water (v. 5, c. 14)" discusses using a mass balance approach to investigate not only natural systems but contaminated sites as well. A case study of a Toxics Program investigation of a subsurface solvent plume at Naval Submarine Base Kings Bay, Georgia, is presented in the chapter. A plume of gasoline from a leaking underground storage tank in Galloway Township, New Jersey. The chapter on "The geochemistry of waste disposal facilities in groundwater (v. 9, c. 16)" presents results from the Toxics Program investigation of the fate of landfill leachate at the Norman Municipal Landfill, Norman, Oklahoma. The chapter discusses the results of investigations into the subsurface biogeochemical processes that control the fate of the landfill's leachate plume. The contributions from Toxics Program scientists presented in the Treatise are evidence of the impact the Toxics Program has had on the field of geochemistry as applied to the presence of toxic substances and hazardous waste in the environment. The Treatise will be an indispensable reference not only to academics but to contamination cleanup professionals, resource managers, and environmental regulators as well.